My name is Billy and I am recovered drug addict. I wanted to take a moment here to talk about my experience at Origins Recovery. I am 7-year user of heroin and other opiates. By the time I was 16, I was heavily addicted to painkillers, which I had initially received for a sports injury. The effect produced by this painkiller fixed all of my problems. By the time I was 22, I had been to multiple treatment centers and built a bright life and burned it to the ground on multiple occasions. After a multitude of relapses in 2015 and my family finally washing their hands of me, I drove myself to Origins on New Year’s Eve 2015 – the best decision I have ever made. After two days in treatment, I wanted/needed to leave to get high and I fought myself with every ounce of will that I had. I remember one of the staff members looking me square in my eyes and telling me, “You can get well here”. I did not think that was possible but something profound happened in that room and by the Grace of God I stuck around and the results were electrifying. I had a spiritual experience that was sufficient to overcome my heroin addiction. 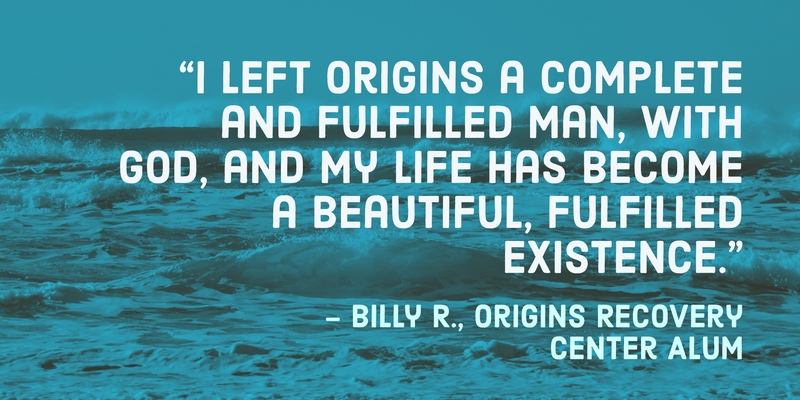 I left Origins a complete and fulfilled man, with God and my life has become a beautiful, fulfilled existence. Every single thing I ever wanted in life has become reality and much more due to the 12 Step program of action. Without the knowledge and experience I gathered at Origins Recovery Centers, I would not be here to write about my profound experience. Thank you Origins for helping me find what I have so longed for. Can’t quit? Can’t control? Thank goodness you can call. 844-843-8935.